'A remarkable book - a worthy tribute both to the man John Wilsey calls "e;an unusual hero"e; and to the ethos of the British Army in which he lived and died.' John Keegan in his ForewordThis is the biography of the Falklands War hero whose death in the battle for Darwin and Goose Green was one of the turning points in the whole campaign. It is written with the consent of H Jones's widow, … Sara, and is published to coincide with the twentieth anniversary of his death at the climax of the Falklands War. 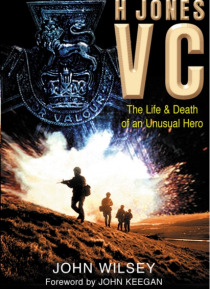 It is the story of an emblematic but complex war hero whose family history was unusual, whose army life included exposure to most of the military problems which Britain has encountered since the Second World War (including security in Northern Ireland, where H Jones was responsible for the search for Robert Nairac), and whose dramatic death and subsequent posthumous VC symbolised an extraordinary campaign which was truly the end of an era.